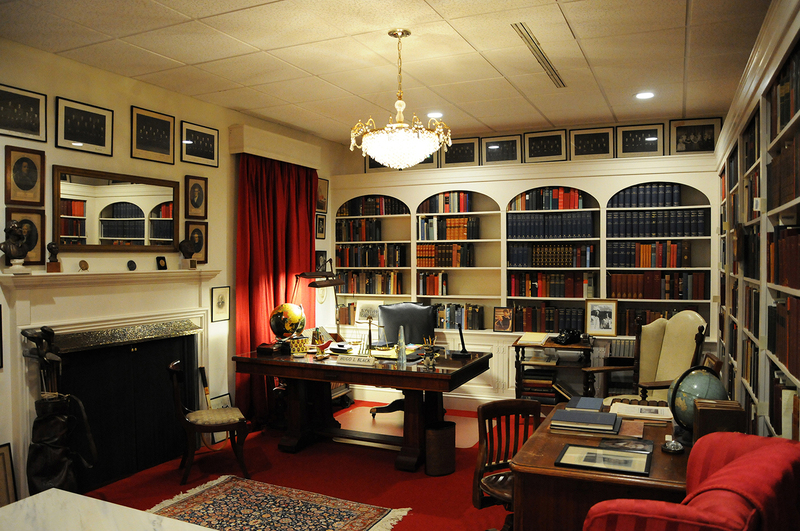 Following significant renovations this summer, the Hugo Black Study at the Bounds Law Library has reopened to visitors. The exhibit, which is a replica of Justice Black’s Alexandria Virginia study, underwent improvements including repainting, a new ceiling, and redesigned lighting. 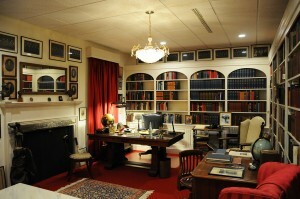 The study contains contents and furnishings donated by Mrs. Elizabeth Black and more than one thousand volumes belonging to Justice Black that were transferred to the law school by the Supreme Court Library in 1983. As United States senator and supreme court justice, Black collected the works of his favorite authors and accumulated an impressive number of volumes on law, history, philosophy, and other topics. He underlined and annotated many of his books, making them a unique source of insight into his thoughts and opinions. The collection is located in room 211 of the Bounds Law Library and is available to scholars by appointment, and the public is invited to view the study during regular library hours.